One look at this stern faced group is all it took to convince us it was no idle suggestion. 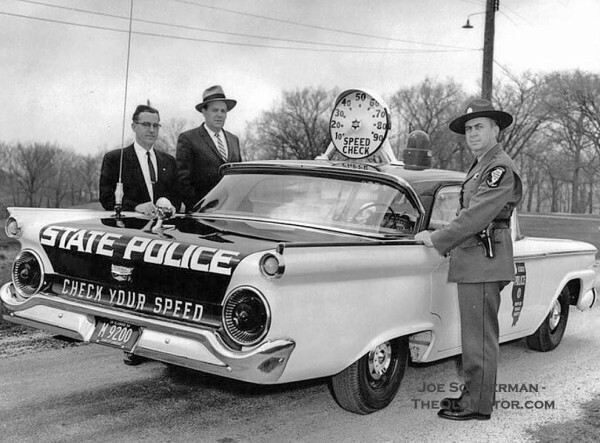 In our digital age of radar and laser speed guns and roadside robo-cops, this 1959 Ford decked out with an enormous analog speedometer might seem quaint, but we suspect that these lawmen might have had a few tricks of their own up their sleeves. Surely, any motorist they nabbed couldn’t use the excuse that his speedometer wasn’t reading right. You’ll find and more Missouri and Route 66 related photos and articles from the Joe Sonderman Collection previously posted on here The Old Motor. Take a moment to check out Joe’s new book on Route 66 in Texas. This entry was posted in Auto photos 1946 - 1965 and tagged 1959 Ford, Illinois State Police, radar gun, Route 66, Speed Radar, speed traps. Sorry, this appears to be the Ill. state police, not Mo. Mo. was called the “state patrol” in the old days. Now they are called the “state highway patrol”. To my experience the state boys in Mo. have been the fairest police dept. in the whole state. If you make a mistake they usually let you off with a warning, unlike some of the locals. Joe, Thanks for pointing that out but it does in fact appear to be an Illinois State Police car as the state map is on the front door. That suggests that they are not lurking in the bushes to collect tribute! As you pass into Oklahoma from any bordering state you are greeted with the injunction “watch your speed, we are” I wrote to the local rag that what Oklahoma needed was a mail in contest for suggestions about what we are….essentially! They could have been grammatically correct and saved themselves an extra letter by simply substituting “do” for “are”! Perhaps I’m just a pedant! That Ford would probably only do about 90, so if you were driving something faster–or better handling–and they didn’t see your license plate, you just might escape capture.